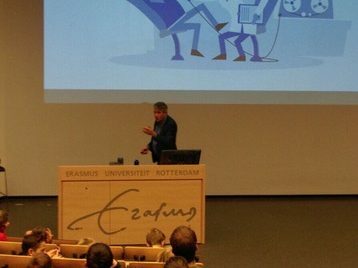 On 10 October, at Erasmus University Rotterdam, Jeroen Jansz opened the Lesson series ‘Gaming’ for primary school children. The course was developed by Wetenschapsknooppunt Erasmus University (Public Science) in collaboration with Jansz, also building upon PGIC research. About 140 pupils will spend 6 lessons on the nature of (digital) games and their effects. They will practice interviewing as a scientific method and develop their own game.